Settlement occurred sometime prior to 1878 when the first post office opened for business. The postmaster, one Bill Spitler, was a thoughtful and thankful man. Thoughtful because he sensed the state didn't need a Spitler, Texas and thankful since he suggested the name of the ship that delivered him to Texas shores. By the 1880s, Naruna had a respectable population of 150 (mostly farmers) who mainly raised livestock and grew cotton. Naruna was a shipping point but although that was an indicator for growth, Naruna grew not. By 1890, the census counted a mere 25 people. The reason was the familiar story of railroad bypass. Enough people moved in to bring the population up to 75 by 1892 but hopes of prosperity were dashed. 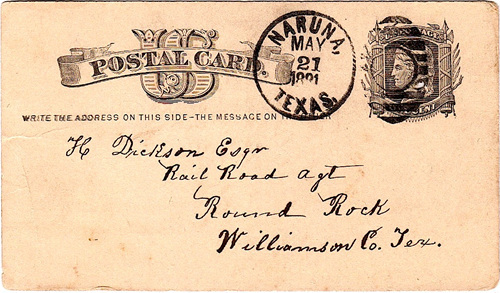 The post office closed its doors in 1906 and mail was rerouted through Lampasas. It bottomed-out during the Great Depression with only 10 residents but this number increased by the mid-1940s to 45. This was around the time when the Naruna School merged with those in Lampasas. From the mid 1960s to 2000, Naruna had reported 45 people. Naruna Baptist Church Settlers came to the Naruna area as early as the 1840s, and the town was named by its first postmaster, William M. Spitler, who came to Texas on the riverboat Naruna. Residents formed Providence Baptist Church in July 1877 under the leadership of Ira Reese. 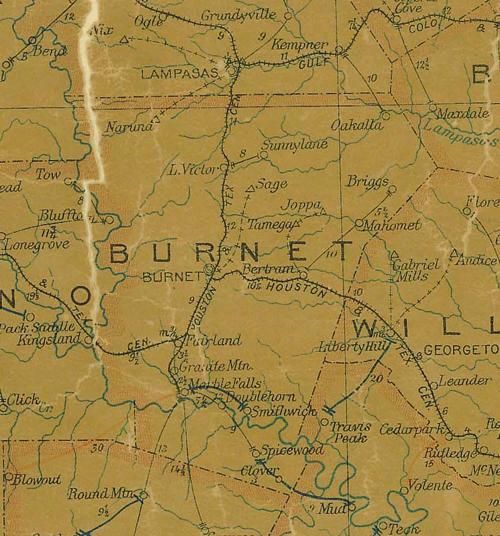 The congregation called its first minister in 1878 and later became part of Austin Baptist Association. Members held baptisms in Deer Creek and built a sanctuary in the early 1890S, sharing space with local Masons. The congregation changed its name to Naruna Baptist Church in 1932. Local population declined after the railroad bypassed the town, but the church continues to serve members through worship and charity work.